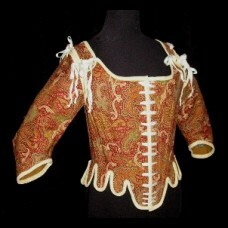 17th century style has a more square neckline and no tabs. 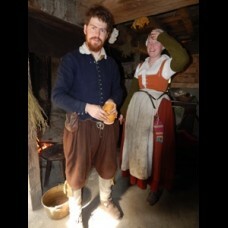 Shown in photo at Plimoth Plantation. 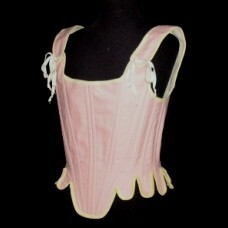 Th..
Our reversible, partially boned stays are the type that were worn up until about 1630. They have ve.. In 1765 a stay maker advertised "cork stays, whale-bone stays, jumps, and easy caushets, thin boned ..
We are liquidating our display stays. 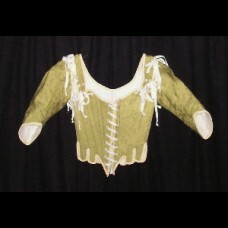 We have stays made of light green apple damask with tie-on sle..
Not comfortable wearing boned stays around camp but still want to be period correct? 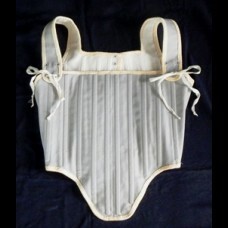 Jumps ar..
18th century style partially boned stays with shoulder straps, meant to be worn as an undergarment.T.. 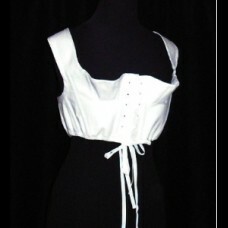 This is the undergarment needed to give the proper Regency period sillhouette! The short stays lace ..